This book concentrates on the final chapter of the story of perhaps the most famous mathematics problem of our time: Fermat's Last Theorem. The full story begins in 1637, with Pierre de Fermat's enigmatic marginal note in his copy of Diophantus's Arithmetica. It ends with the spectacular solution by Andrew Wiles some 350 years later. 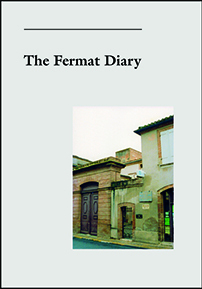 The Fermat Diary provides a record in pictures and words of the dramatic time from June 1993 to August 1995, including the period when Wiles completed the last stages of the proof and concluding with the mathematical world's celebration of Wiles' result at Boston University. This diary takes us through the process of discovery as reported by those who worked on the great puzzle: Gerhard Frey who conjectured that Shimura-Taniyama implies Fermat; Ken Ribet who followed a difficult and speculative plan of attack suggested by Jean-Pierre Serre and established the statement by Frey; and Andrew Wiles who announced a proof of enough of the Shimura-Taniyama conjecture to settle Fermat's Last Theorem, only to announce months later that there was a gap in the proof. Finally, we are brought to the historic event on September 19, 1994, when Wiles, with the collaboration of Richard Taylor, dramatically closed the gap. The book follows the much-in-demand Wiles through his travels and lectures, finishing with the Instructional Conference on Number Theory and Arithmetic Geometry at Boston University. There are many important names in the recent history of Fermat's Last Theorem. This book puts faces and personalities to those names. Mozzochi also uncovers the details of certain key pieces of the story. For instance, we learn in Frey's own words the story of his conjecture, about his informal discussion and later lecture at Oberwolfach and his letter containing the actual statement. We learn from Faltings about his crucial role in the weeks before Wiles made his final announcement. An appendix contains the Introduction of Wiles' Annals paper in which he describes the evolution of his solution and gives a broad overview of his methods. Shimura explains his position concerning the evolution of the Shimura-Taniyama conjecture. Mozzochi also conveys the atmosphere of the mathematical community—and the Princeton Mathematics Department in particular—during this important period in mathematics. This eyewitness account and wonderful collection of photographs capture the marvel and unfolding drama of this great mathematical and human story. Mathematicians and the general public interested in Fermat's Last Theorem and the mathematicians and mathematics involved in solving the puzzle. Written in a lively style and is easy to read and as such, it can be recommended to those of us who were not lucky enough to have an opportunity to follow these events personally. With its many interesting facts, often unattainable to those not directly engaged in the story, its many personal quotations, and pictures of personalities involved, the book will certainly be an important source for historical details surrounding the proof for contemporaries and those born later. A carefully crafted diary … a careful and well-controlled attempt to explain the context of the proof and the contribution of its principal participants. Moreover, the author is a photographer who took on himself the task of portraying the participants in the events he reports. As a result one is rewarded with a fine rogues' gallery of the contributors … This is a strait-laced and calm version of the story, but one well worth reading. In brief: Should you buy the book for a friend? I say, Yes. This book can make us feel closer to the way in which Wiles' work was received and is being assimilated by the mathematical world. I recommended it as an addition to both personal and institutional libraries. The author provides a splendid eyewitness account of the drama surrounding the proof of Fermat's Last Theorem by Andrew Wiles … The text provides compulsive reading … this is in general a book affording the most pleasure to specialists; however, it should be said that there are still many aspects of interest for the general mathematician … I cannot imagine anyone directly involved with the events leading up to the proof of Fermat's Last Theorem not wanting a copy of this lovely book. And for others, the book provides an entertaining and marvelous record of a landmark in mathematical history. Mozzochi provides us with a great deal of valuable primary data. The photographs, in particular, will be of great value to future historians.